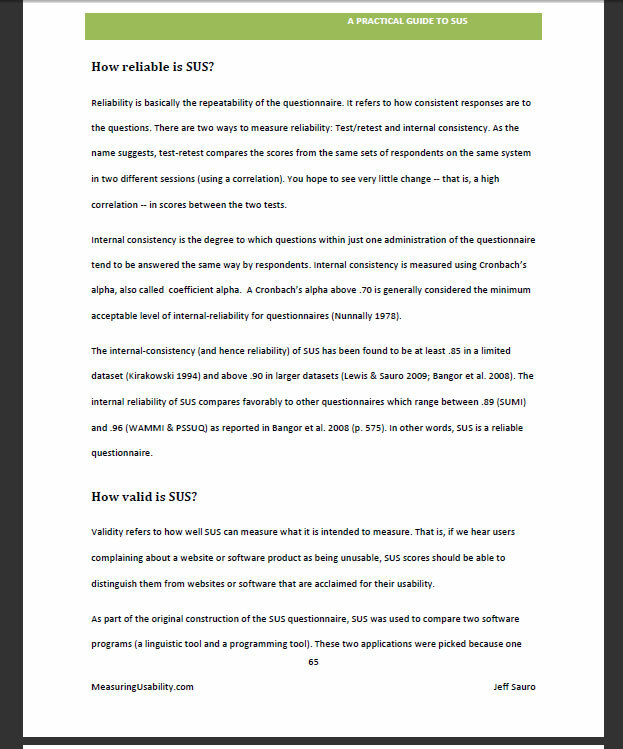 This package contains both the SUS Calculator and 150 page Practical Guide to SUS. 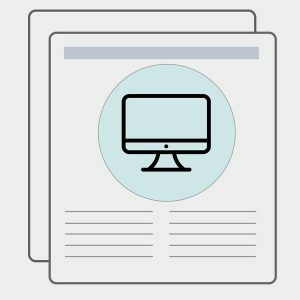 It contains many examples, graphs, tables, benchmarks and best practices for using SUS. 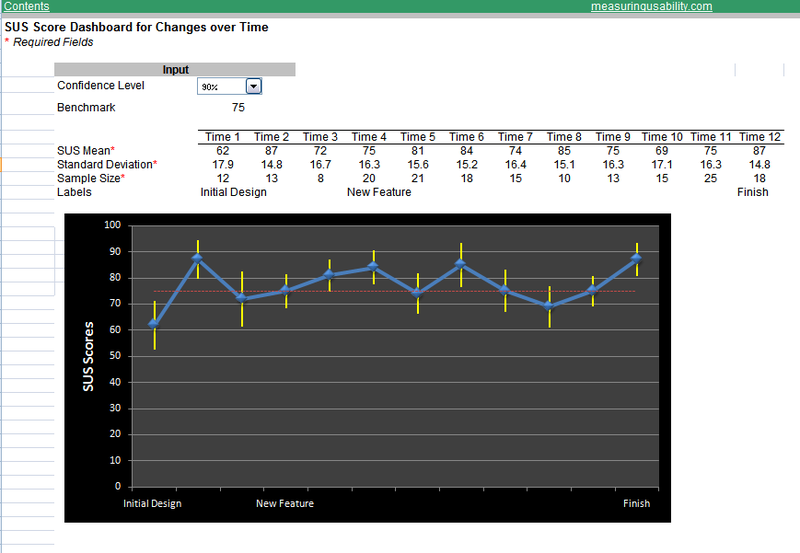 The calculator helps prevent improper coding, compares two SUS Scores statistically, handles missing values, computes sample sizes, converts SUS scores to percentile ranks and letter grades and checks the internal reliability of the responses. Score The SUS Properly: 10% of SUS questionnaires contain coding errors. The calculator includes several checks to prevent miscoding. 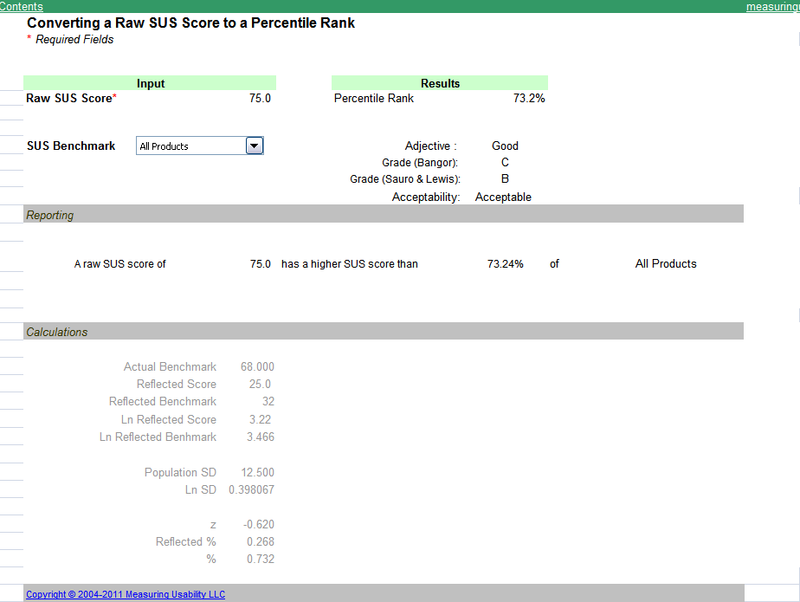 Converts SUS scores to Percentile Ranks: Compare your SUS score to data from 500 studies by application type (e.g. 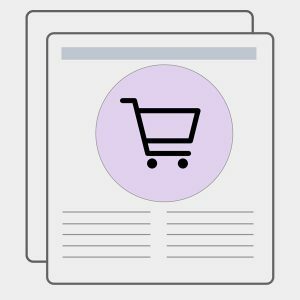 websites, consumer software, hardware, IVRs). 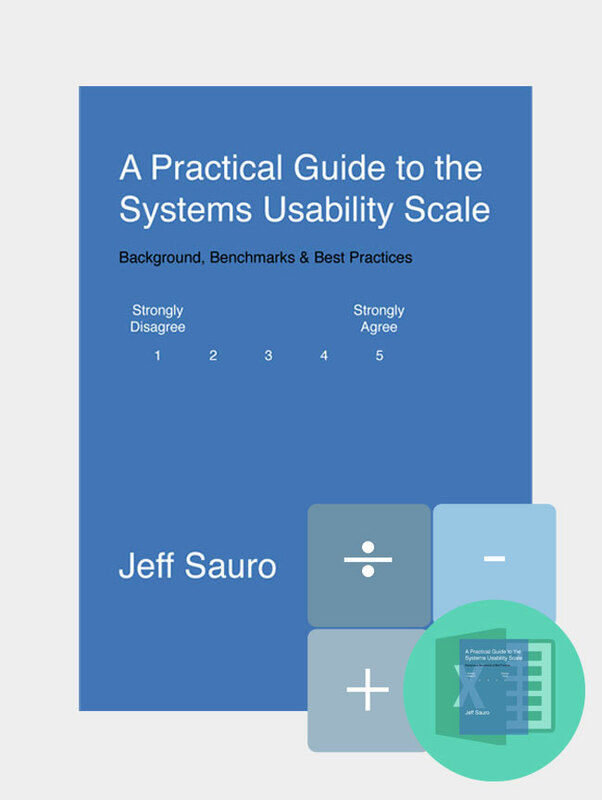 For example, a percentile rank of 75% tells you your application has higher perceived usability than 75% of all applications in the database. 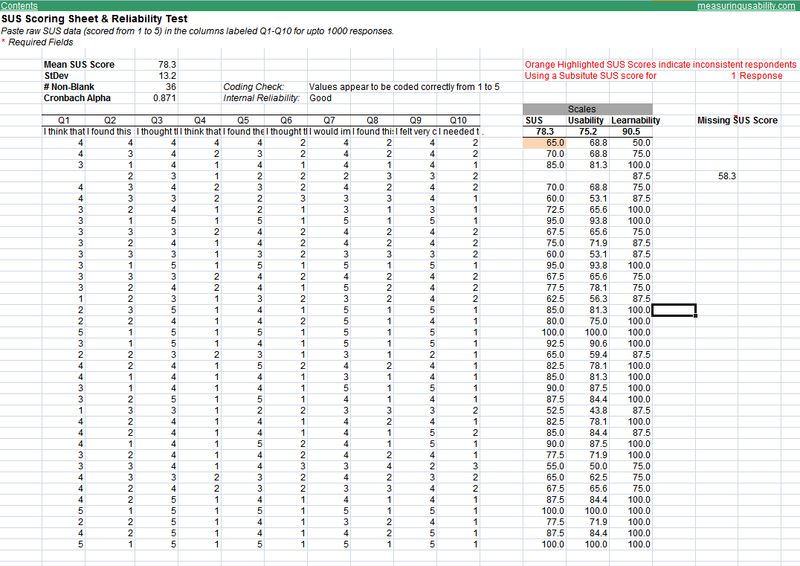 Converts SUS scores to Grades (A+ to F): Using my large database of studies, I converted the percentile ranks to letter grades. A grade of a "C" equals the 50th percentile (meaning average) and a grade of an "A" is any SUS score above an 80.3. 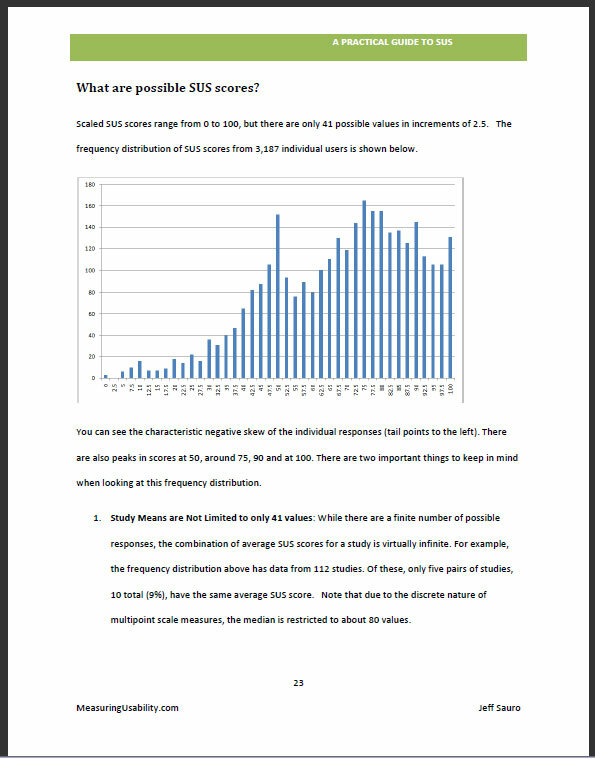 Compares SUS Scores Statistically: Compare Two SUS scores, a single SUS score to a benchmark and generate confidence intervals. 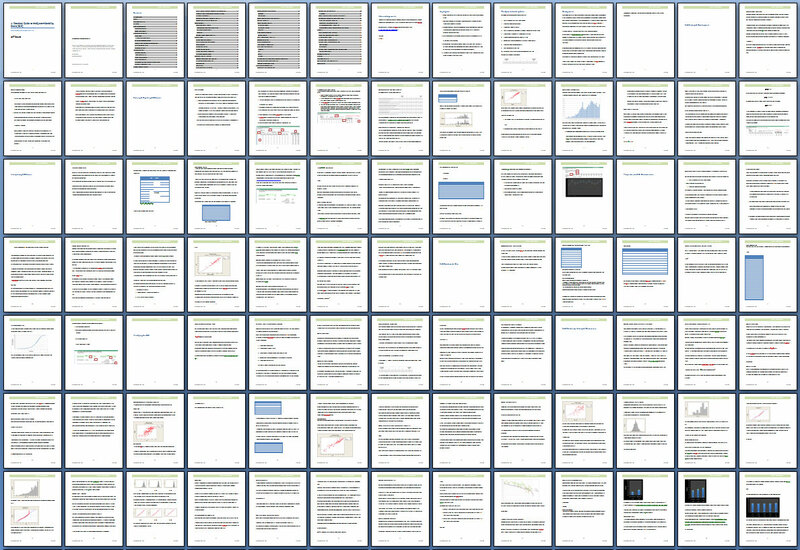 There are calculations for between and within-subjects studies. 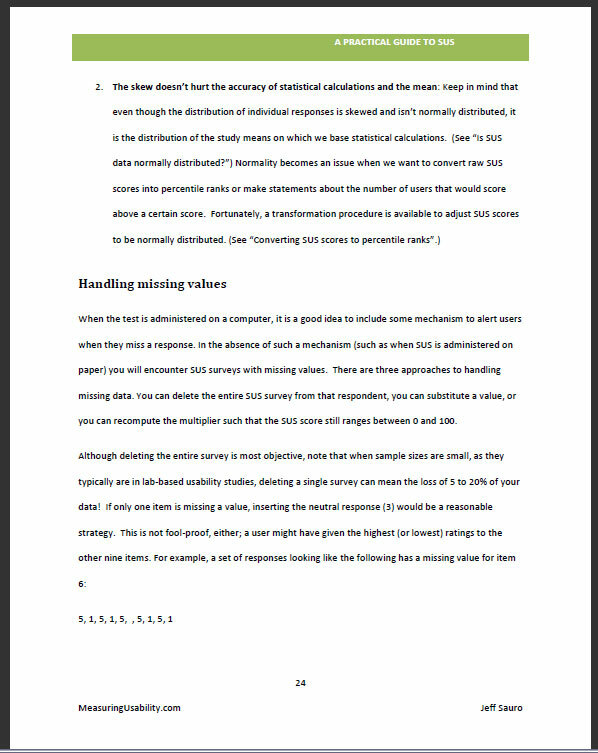 Handles Missing Values: Uses a substitute method for estimating missing values which can be essential when sample sizes are small. 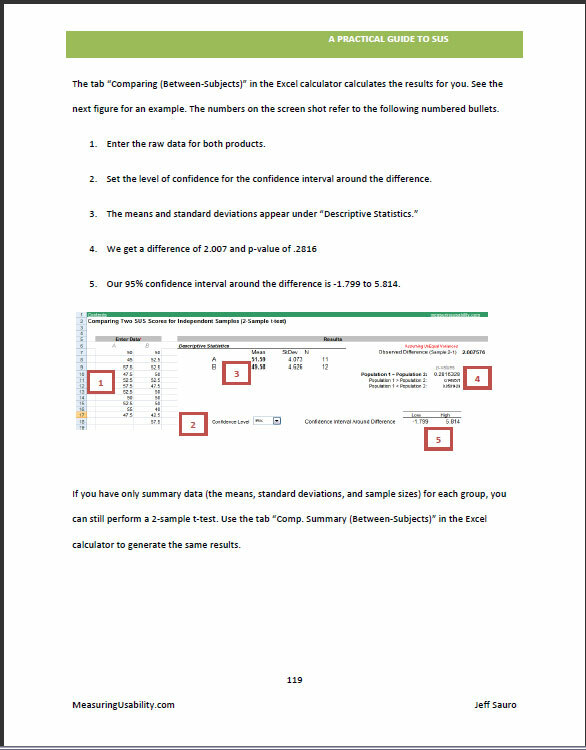 Computes Sample Sizes: Instead of relying on general rules-of-thumb, the calculator computes the best sample size for all study-types. Checks for Inconsistent Respondents: The calculator flags respondents who are agreeing to too many favorable and unfavorable responses. This suggests users weren't paying attention or there was a coding error. Checks internal reliability: Cronbach's alpha is calculated from your raw responses. The calculator will tell you if the reliability of your responses is acceptable or poor.